For other uses, see Kaslo (disambiguation). Kaslo is a village in the West Kootenay region of British Columbia, Canada, located on the west shore of Kootenay Lake. 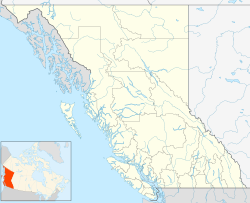 Known for its natural environment, it is a member municipality of the Central Kootenay Regional District. As of 2016, it had a population of 968. Kaslo was designated as a sawmill site in 1889, and expanded due to the silver boom of the late19th century. It retains much of the historic atmosphere from its earlier mining days. The town today relies mainly on the industries of forestry and tourism. Kaslo was incorporated as a city on August 14, 1893, making it the oldest incorporated community in the Kootenays. It was an important center for shipping and silver ore mining. After the silver rush Kaslo's fortunes faded but it was re-incorporated as a village on January 1, 1959. The SS Moyie, which worked on Kootenay Lake from 1889 until 1957, found a permanent home on Front Street in Kaslo. Beautifully restored by the Kootenay Lake Historical Society, it is the oldest intact sternwheeler in the world and draws thousands of visitors every year. Village Hall, built in 1898, is one of only two intact wooden municipal buildings that are still in use in Canada. The Kaslo Golf Club is a 9-hole course which plays as a 2,824-yard, men's par 35, women's par 37 course. Kaslo's Golf Club dates back to 1923, when locals invested and donated their efforts and created a 4-hole course. This makes it one of the oldest in British Columbia. A new timberframe clubhouse was built in 2007. In 1941, Kaslo was selected as one of many sites throughout BC for the internment of Japanese Canadians. Kaslo has been featured on the historical television series Gold Trails and Ghost Towns (season 2, episode 2). Kaslo was also featured in the 1995 film Magic in the Water starring Mark Harmon and Joshua Jackson. ^ a b Statistics Canada. "2016 Census Statistics for Kaslo, British Columbia". Retrieved 2007-07-03. ^ Kaslo.ca. "Kaslo history". Retrieved 2007-07-03. ^ Kootenay Lake Historical Society. "SS Moyie National Historic Site". Retrieved 2007-07-02. Wikivoyage has a travel guide for Kaslo. This page was last edited on 28 November 2018, at 03:20 (UTC).